The Christian cross is one of the most well-known emblems across cultures, so why not make this poignant symbol a permanent part of your jewelry collection? Apples of Gold introduces a premium quality, expertly crafted gold cross pendant to meet your needs. 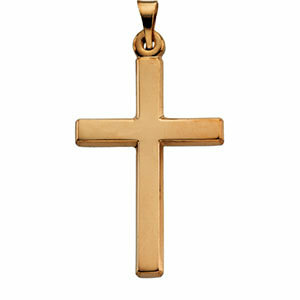 The solid 14K yellow gold cross pendant has a traditional but classy feel to it. With perfectly perpendicular angles and clean lines, this pendant makes a statement in proper proportions. The yellow gold is buffed for a beautiful glow and will become the most well-known piece in your jewelry box with all these wonderful features. 24.5mm x 16.5mm (15/16" x 5/8"). We guarantee our Polished Plain Latin Cross Pendant 14K Yellow Gold to be high quality, authentic jewelry, as described above.